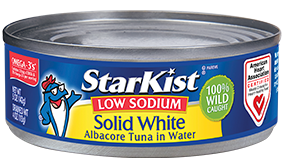 StarKist® Low Sodium Solid White Albacore Tuna in Water uses only choice cuts of tuna to give you an outstanding taste experience. Each can contains a solid fillet of delicious albacore tuna that is naturally lower in fat and cholesterol than beef or chicken. With only 120 mg of sodium per serving, it’s an excellent choice if you are watching your sodium intake.